The green movement has steadily grown over the years with the rise of builders and homeowners concerned with the environment. IBS Advisors, LLC, is a residential consulting firm in San Antonio that works with efficiency-minded clients to integrate the latest in building science, design and best construction practices in their homes. 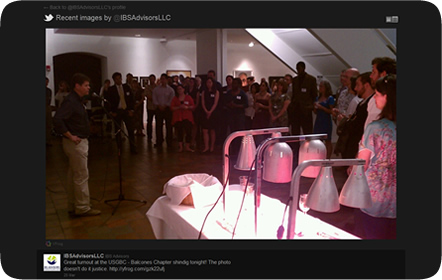 IBS Advisors, LLC, also holds training sessions for raters, field inspectors, energy-related methods, green building and more. 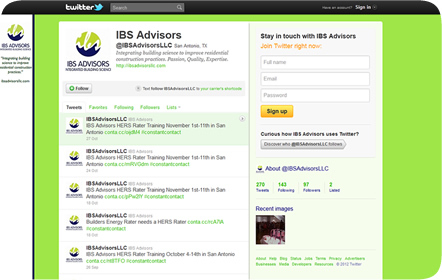 We set up and designed a Twitter page for IBS Advisors to inform the company's followers of the latest breakthroughs in efficiency practices and environmental news. Taking cues from their current website, we incorporated the same vivid green and logo in the background along with the company's motto. Their tweets also mention the classes offered by IBS, including the dates, times and locations, an integral part of the company.